Baingan is also known as Aubergine, Eggplant and brinjal. There are many ways to roast baingan for bharta. You can roast them on naked flame, microwave them or broil in an oven. 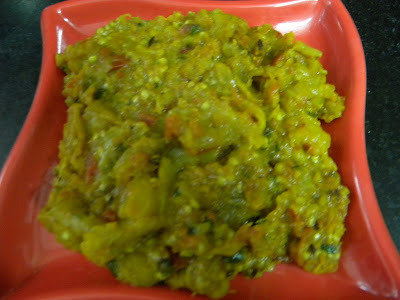 Baigan bhurta tastes good with phulkas, parathas or even rice. 1. Prick baingan with a fork and roast on a naked flame till their skin appear blistered and they shrivel in size. Alternatively you can also microwave them on a High for 10 minutes. 2. Cool baingan by dipping them in water. Peel off the skin and mash them. 3. I prefer mustard oil for this dish. Heat mustard oil to the smoking point in a pan and add cumin seeds. When they turn brown, add onions and saute till they are transparent. 4. Add ginger and garlic and saute for 1 minute. Add red chilli powder, coriander powder and tomatoes. Cook till oil begins to separate. 5. Add mashed baingan and salt. Cook for 7-8 minutes over medium heat stirring. 6. Garnish baingan bharta with chopped coriander leaves. levels and can block the free radical formation.